The following is an 1822 Plat map from the Office of the U.S. Surveyor General. It shows a portion of what would have been known as the Batchelors Grove settlement at the time. Section 8 of the Plat map is where Batchelors Grove cemetery is located. For general information on these types of maps see the paragraphs below. The following was extracted from the Federal Township Plats of Illinois web site. 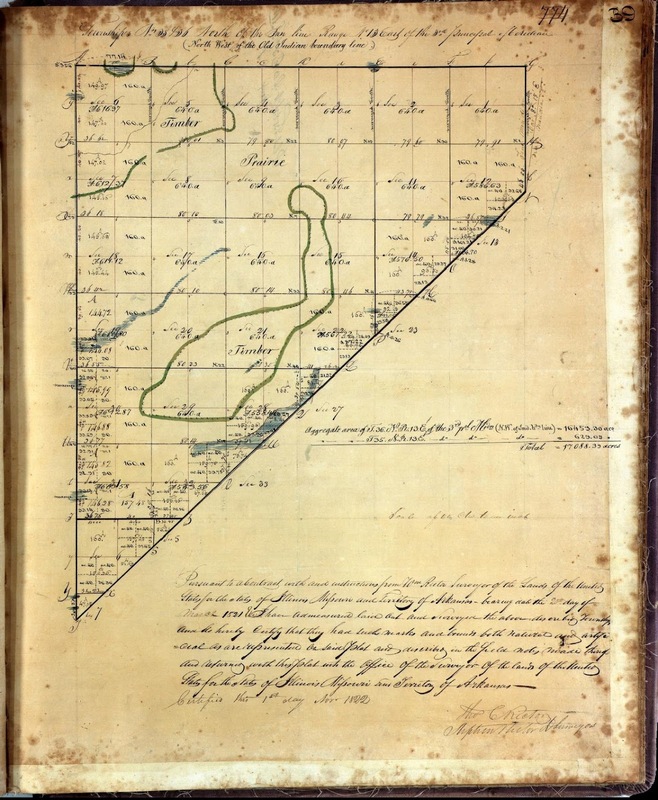 The Land Ordinance of 1785 created the rectangular survey system for mapping and sale of the western public lands of the United States. 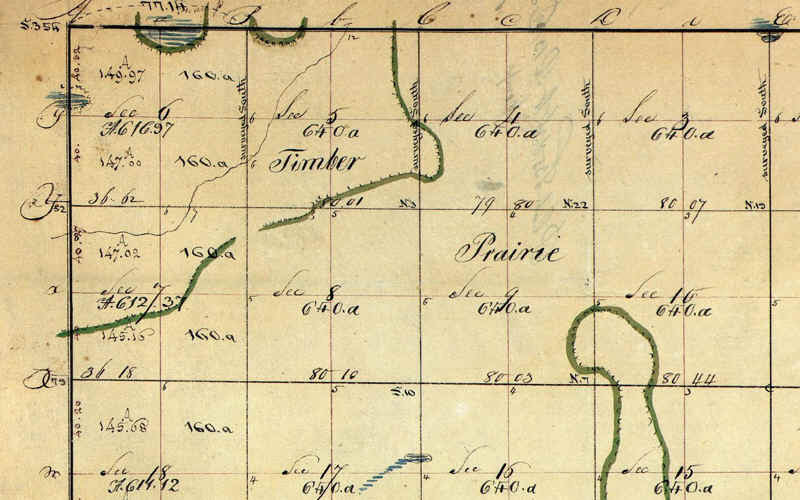 The federal statute established a coordinate system for locating townships based on the intersection of a north-south meridian and an east-west base line. It provided for the creation of townships of six miles square and, when necessary, fractional townships. Each township comprised 36 sections, each section having an area of one square mile (i.e., 640 acres). The law also required appointed surveyors to draw plats of the surveyed lands and empowered the Federal government to sell the surveyed lands to the public. In 1796 Congress created the office of U.S. Surveyor General, giving it the responsibility of surveying public lands. The office operated independently until Congress placed it under the General Land Office (GLO) in 1836. In 1849 the newly established Department of Interior assumed responsibility for the GLO. The 1925 appropriations act for the Department of the Interior closed the office of Surveyor General. Surveying responsibilities remained with the GLO until its abolition in 1946. The Bureau of Land Management (BLM) assumed surveying duties on that date. Early in the 19th century surveyors, operating under the authority of the U.S. Surveyor General, began surveying lands that would eventually comprise the state of Illinois. In 1803 the first survey of Illinois lands began with the boundaries of the Vincennes tract, its western region located in present-day Illinois. After completing surveys of the Vincennes tract, the Surveyor General's deputy surveyors started in southern Illinois in 1806. In 1816 Congress established the office of Surveyor General for Illinois and Missouri, located in St. Louis, Missouri. The office's deputy surveyors, moving northward, intersected Illinois' northern boundary line in late 1831 and completed surveying the last townships in 1843. In 1855 the Federal government issued the last contract for the resurvey of an Illinois township. On October 31, 1863 the office of Surveyor General of Illinois and Missouri closed. In following years GLO surveyors conducted occasional surveys of unsurveyed areas such as islands and lakes (1868-1891). The 1796 legislation establishing the U.S. Surveyor General required the production of three copies of each plat. In 1869 the U.S. government transferred the Illinois records of the St. Louis office of the Surveyor General to the Governor of Illinois. In 1883 the Auditor of Public Accounts accepted custody of the records. Since 1957 the Illinois State Archives, operating under the Secretary of State, has maintained the Illinois records of the Surveyor General. The National Archives has custody of the copies of the plats originally sent to the Washington, DC headquarters and Illinois' local land sales offices of the General Land Office.